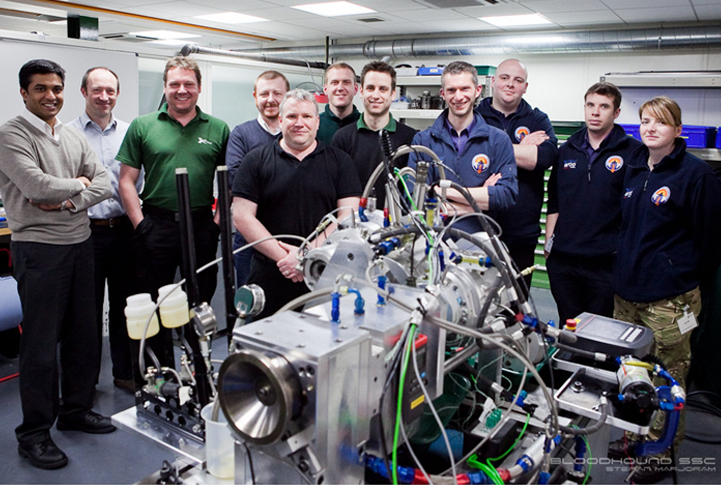 BLOODHOUND SSC and ABC Autosport Bearings and Components... Gearing up! “A goal is a dream with a deadline.” (Napoleon Hill) – The Bloodhound Project (dream project to some) is certainly a Scientifically Engineered goal. A challenge which is inspiring the inventive minds of the next generation of scientists, engineers, mechanics and designers, the military and the air force as well as captivating a worldwide audience is fast approaching its final assembly. With possible locations being narrowed down to South Africa, The Bloodhound will soon be giving the existing land speed record a run for its money. This supersonic 1000mph car has a jet and rocket powered engine designed with car and aircraft technology. Astonishingly, it weighs over 7 tonnes and has a staggering combined horsepower more than all of the F1 cars we see at the grand prix! Leading supplier in Bearings, Lubricants and Adhesives for Motorsports, ABC Autosport Bearings and Components are thrilled in becoming a mechanical support for the World’s 1000 mph Supersonic car. We are privileged in working with the Bloodhound’s technological-fuelled Mechanics and Engineers in supplying vital parts to the gearbox. With our own adventurous product ranges and ‘supersonic’ delivery, ABC made sure products supplied were going to live up to the lasting legacy. Throughout the initial design process, we identified that the bearings in the gearbox would be in an environment not experienced in modern day racing, therefore we had to choose the best bearings which have a proven consistency of quality, adaptability and endurance; confident choices made for Bloodhound were that of our FAG Ball Bearings, INA Ball Bearings and the FAG/BARDEN Super Precision Ball Bearing. The Bloodhound Project has got firm supporters here at ABC Autosport Bearings and Components; looking forward to the dream becoming reality. *Permission was given for use of the photograph and copy.